Movies are always about escape. For about two hours, we sit in the dark, our eyes glueing to the screen as we escape from reality, everyday life and the familiar world around us. to places we’ve only dreamt of. 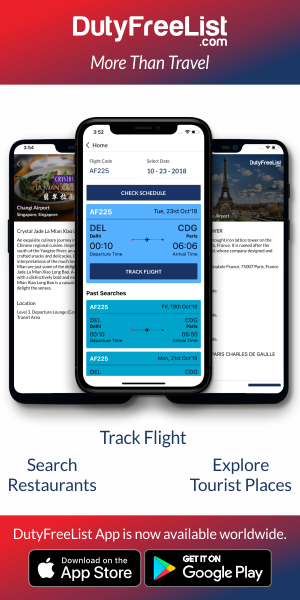 So, if you are ready for a better zoom then check out some of the Best movie locations around the world, and how you can go there too. You might think of Tunisia as being one of the most apparent movie locations. However, the desert landscape and the detached dwellings of southern Tunisia seems perfect for Indiana Jones Raiders of the Lost Ark and Star Wars. 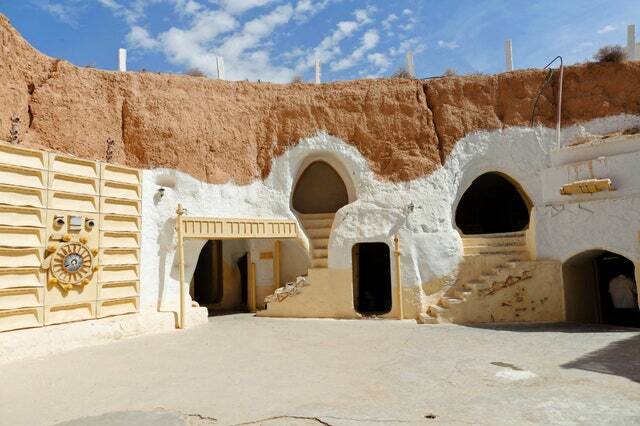 So, if you’re a massive Star Wars fan, then Tunisia might be the best for you. Visit Tozeur and hire a 4 x 4 and feel like you’ve landed on planet Tatooine. An excursion to Matmata should also be at the top of your list. Reason being, it is home to 700 troglodyte homes, the Tunisians still love to live there. They are dug into the landscape to protect them from the oppressive desert heat. The significant attraction in Matmata is the Sidi Driss Hotel. This was the place where the scenes from Skywalker’s childhood home were shot. May the force be with you. 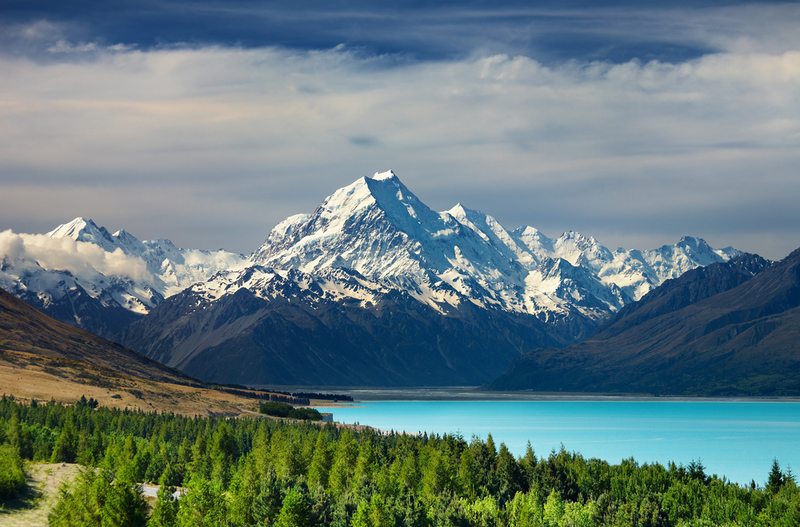 The magnificent scenery in the Lord of The Rings trilogy places New Zealand on the map as a backpacker location. Perhaps it should be named as Land Of The Rings. Kiwi director Peter Jackson never have to search far to find the perfect spot for the magical ‘middle earth’ in the three movies. The Lord of the Rings was completely filmed over 274 days, using 350 purpose-built sets in more than 150 locations. It is the first time that an entire feature film trilogy has been filmed all at one go, making it one of the biggest productions in movie history. The rolling hills of Matamata seem the right choice to house the hobbit holes of Hobbiton. Moreover, the village now presents itself to visitors with a sign saying ‘Welcome to Hobbiton’. Danny Boyle’s film The Beach has made the island of Phi Phi Leh one of the most attractive places in Thailand. The Beach is a story depicting a backpacker in search of a fabled idyllic beach he has heard about in Bangkok. Undoubtedly, what better place to film it than the paradise beach of Hat Maya. There was a lot of controversy surrounding the filming. However, as there were allegations of vandalism post imported palms were planted to make the beach even more idyllic. In the James Bond movie The Man with the Golden Gun, the ‘Villain’ Scaramanga’s island hideout is Khow-Ping-Kan. 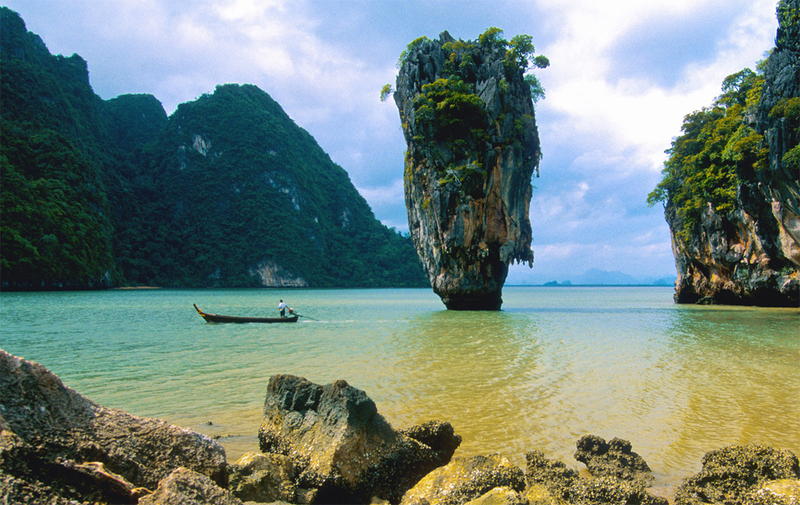 It is one of a chain of tiny jungle-covering limestone pillars in Phang Nga Bay at Phuket. ‘James Bond Island’, AKA undiscovered paradise, is now flocking heavily with tourists taking the boat trip out to the marooned island in the Andaman Sea. Can you guess what’s the most uplifting things about Mamma Mia apart from the classic Abba tunes and all-star cast dancing around? Yes!! you got it. It is the beautiful blue waters, narrow cobbling streets and whitewash houses of Greece. Mamma Mia was filmed on the rich islands of Skopelos and Skiathos, two of the Sporades Islands. Skopelos is just about a half-hour hydrofoil from Skiathos, and you can either fly to Skiathos airport or take a ferry from Athens. Skopelos is where most of the locations are apparent. The beautiful church where the wedding takes place is Agios Ioannis Prodromos Monastery, which is perching on top of a 100-metre promontory. 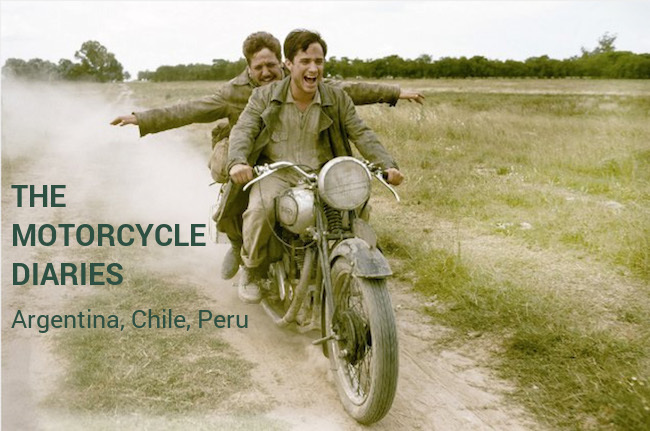 The Motorcycle Diaries revolves around the journey of Che Guevara on a 1939 Norton 500 across 5,000 miles of South America, with his friend Alberto Granado. You don’t who Che Guevara is? He’s the Marxist revolutionary that you can see on all posters, who overthrew the Batista dictatorship in Cuba. The movie is as much about the landscape and the Latin American identity as it is about the origins of the legend and symbol of rebellion, Che Guevara. So if you’re courageous enough to re-create their epic journey, why not do it on a motorbike. The critically acclaimed film Lost in Translation was shot majority wise in Tokyo. In many ways, the location is the ace of the movie. Starring Scarlett Johansen and Bill Murray, this movie tells the love story between an American actor and an equally depressed woman. The actor faces his mid-life crisis during a shooting in Japan while the actress accompanies her husband on a business trip. The Oscar-nominated film is mainly apparent in the two districts of Shinjuku and Shibuya. The Park Hyatt Hotel in Shinjuku where Charlotte and Bob meet is one of Tokyo’s best and most expensive hotels. Moreover, if you want to try sushi and sake delicacy, go to Ichikan, where Bob and Charlotte enjoyed a Sushi dinner in the film. 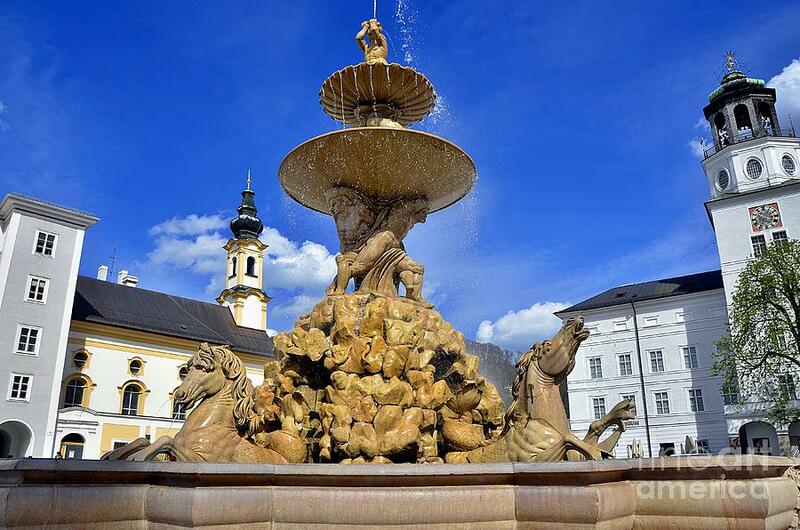 Visit Salzburg, where the Rogers and Hammerstein musical starring Julie Andrews was filmed. It is a place where you can fancy yourself by singing at the top of your voice like Maria. Cinematograph your first kiss in a pavilion, riding around on a bike in Salzburg wearing a set of curtains or marrying to a Colonel. There are various tours and expeditions, but Panorama Tours is the most original. Their buses were used by the film crew and the cast was driven around in their limousines. You’ll have a bright chance to visit Nonnberg Abbey where Maria was becoming a nun. Moreover, you’ll have the chance to explore the Hellbrunn castle where the glass pavilion was reconstructed. It was from the scene You Are Sixteen Going On Seventeen. The Locations listed above are the most beautiful and unique locations of the world worth a must visit. If you’re a big-time movie enthusiast then pack your bags to theses destination are relieve the moment. Your suggestions are always welcome for further explorations in the best movie locations around the world.